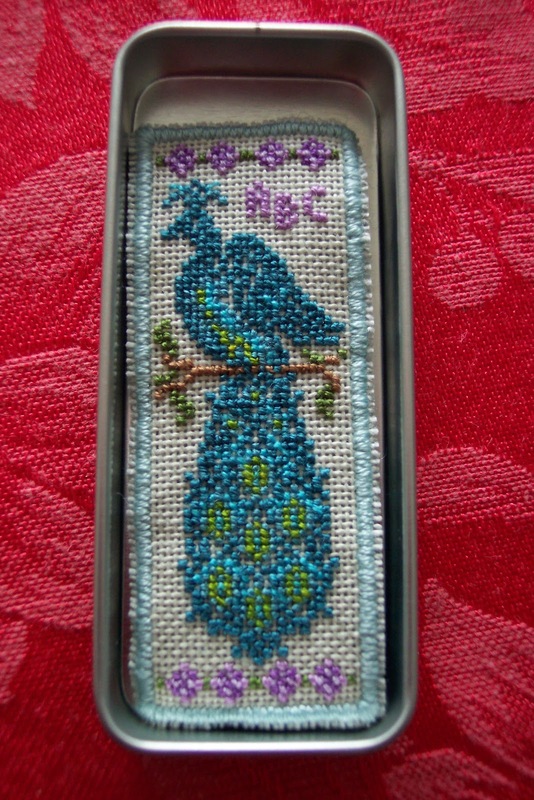 Embroiderers' Association of Canada, Inc.: I Did It! Well, I did it! If you read my December 16th blog, I told you how I like to start something new every Christmas. This Christmas, not only did I start something new, but I also finished it! I purposely chose a small project with the hopes of getting that feeling of accomplishment. I finished it in only 3 days. 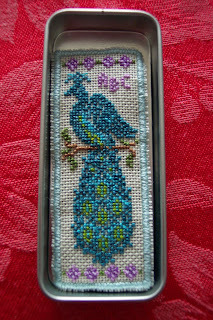 It was the Just Nan “Secret Peacock” needle slide stitched 1 over 1 on 32 count. I normally work on my new project the whole week after Christmas, so thought this year, since I finished it in only 3 days, that I would let myself start something else new. Common sense got the better of me and since I have 5 birth samplers needing to be done, I decided that my second new project would be one of the samplers. My mother-in-law is visiting and has a bit of a cough so we have not been out and about much. 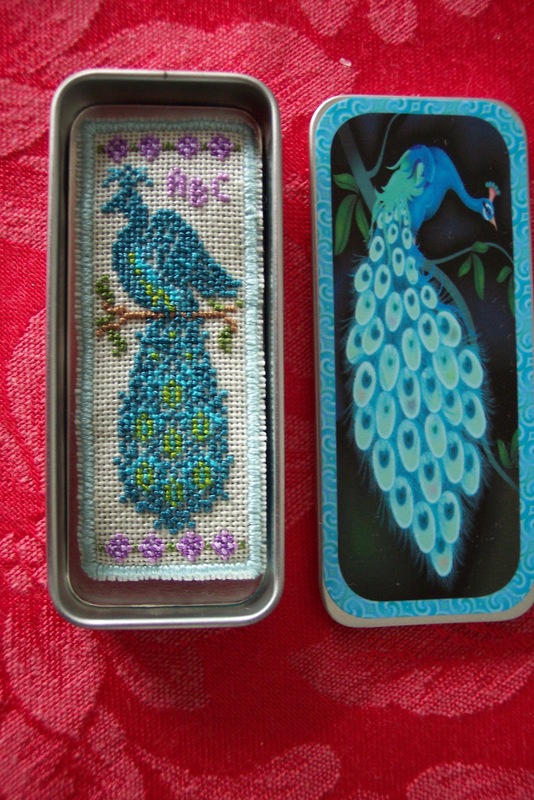 I can’t sit with my hands idle so have been doing lots of stitching. The sampler is moving right along. I once read on a website (if I could remember what site it was, I would give it proper credit) about rotating your projects. I believe she worked on a project for 10 hours, and then moved on to the next one. She started out with 2 projects and once she had finished 10 hours each on them she added another one into the mix. She sometimes had 10 projects on the go, sometimes only 2 or 3, depending on when things got finished. I liked her idea, but did not want that many things on the go at a time and I did not find 10 hours long enough, so I rotate my projects through a week at a time and do not allow myself to be working on more than 3 items at a time (okay, I may have more than 3 projects on the go at a time, but they are not officially in the rotation). That way I work on each work in progress every 3 weeks for a week at a time. Sometimes of course if a birth or wedding is creeping up on me I may have to focus on one project, so the rotation goes out the window but then I have the satisfaction of completing a project and bringing another into the rotation. It is a good way to get yourself to work on a long term project that maybe you are not enjoying working on too much. You know it is only for a week; you can make some progress on it and then you can work on something else. Of course other things such as Guild projects, Seminar classes, etc always seem to creep in there too, but if I try to keep it to 3 projects at a time, I don’t normally climb to more than 5. My big UFO project that is currently in the rotation is a Christmas tablecloth in cross stitch and embroidery which I have mentioned earlier. I worked on it steady through for the 2 weeks leading up to Christmas and am finally starting to think that completing it by our June meeting may just be a possibility. The tablecloth was a part of one of my grandiose plans. I was going to stitch a tablecloth for all my nieces and nephews (19 of them to be exact…more on this in my next blog). Well, I got one done and gave it to my niece Deanna. Then I started on this one which is still a work in progress. Of course, like anything, when I make up my mind to do something, I go out and buy all the stuff with big plans, so up in my trunk upstairs are quite a number of stamped tablecloths to be stitched. Someday I will have to do a count. Anyways, when this tablecloth was not moving along so quickly, I stated that maybe I had overestimated my time and that I should perhaps focus on making everyone Christmas stockings instead. Deanna of course graciously stepped up and said I was more than welcome to start with her first again. L I have not made any Christmas stockings. I have managed to make something for weddings and babies though, so think I am doing pretty good at holding up my end of the Auntie bargain.